This year Navarathri celebrations are from 25th September to 2nd October. Vijaya Dasami on 3rd October. As per the Almanac, the Mahalaya Amavasya is on 23rd September. As Amavasya thithi is also prevailing on 24th till 12.25PM (IST) the nine day puja which starts only on Pradamai thithi,this year starts on Thursday (25th September)Arranging golu padi (dolls) and kalasastapana can be done on 23rd or 24th (till amavasya thithi rules)during an auspicious time. This year there are only eight nights of celebration instead of nine nights.Again the Ashtami thithi is only upto 8.47am on eighth day (2nd October) so the puja for Ashtami and the Durga Ashtami festival is on 1st October. Since it is on 7th day both saptami and ashtami puja is on 1st October. I am posting the link for spread sheet(chart) giving the details of nine ways of worshiping and offering to be made during the 8 days. In India in every Hindu home Shakthi the Mother Godess is honoured in their own tradition. Even in temples Durga Devi is portrayed as blessing the visiting devotees in various forms during the ten day festival. In accordance with the lunar calender, as per the astrological star of each day, Alankaram (form) is chosen to symbolize the triumph of good over the evil and portrayed on all 10 days. Source: Kanaka Durga Temple, Vijayawada, A.P. 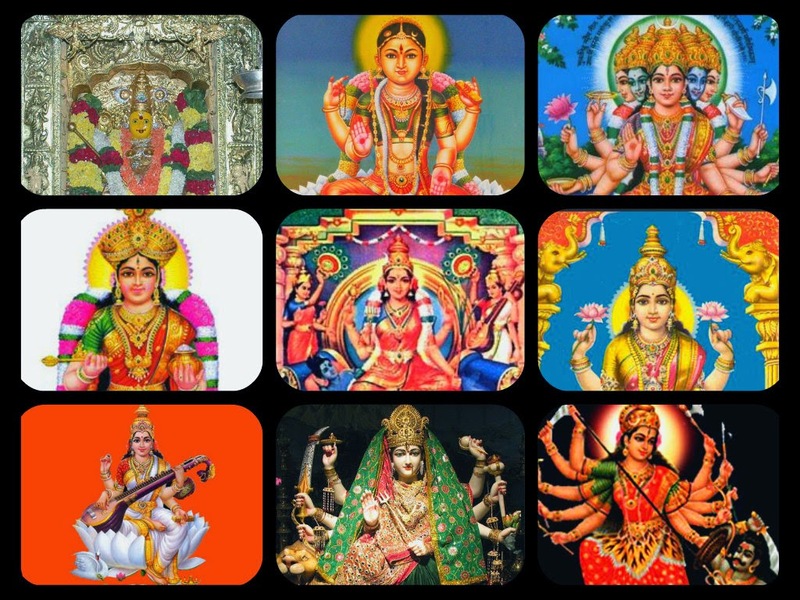 Let us Pray Devi by chanting slokas of Durga, Balathripura Sundari, Gayathri, Annapoorani, Lalitha Thripura Sundari, Mahalaxmi, Saraswathi, Mahisasuramardhini. Rajarajeshwari on Dasami is the Alankaram in temple. MAHADEVYAICHA VIDHMAHE SARVASHAKTHYAICHA DEEMAHI THANNO DEVI PRACHODAYATH. Happy Bathakamma to all my friends in Hyderabad. Bathakamma Panduga is the special way of celebrating Navarathiri in Telangana region. It is a delight to watch ladies and girls performing the fete around the decorated flower plate. This is another form of worship to Maa Durga from her devotees.